Short and deep, this book is an excerpt from the upcoming fourth edition of CSS: The Definitive Guide. 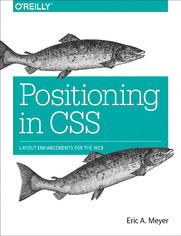 When you purchase either the print or the ebook edition of Positioning in CSS, you&#8217;ll receive a discount on the entire Definitive Guide once it&#8217;s released. Why wait? Make your web pages come alive today. Eric A. Meyer is an author, speaker, blogger, sometime teacher, and co-founder of An Event Apart. He&#8217;s a two-decade veteran of the Web and web standards, a past member of the W3C&#8217;s Cascading Style Sheets Working Group, and the author of O&#8217;Reilly&#8217;s CSS: The Definitive Guide.